After 12 weeks of hearings in India's Supreme Court, Médecins Sans Frontières (MSF) has learnt that final arguments into the Novartis vs. Union of India case challenging the interpretation of Section 3d of India's patent law have today come to an end. During the hearings, which started on 11 September, the two judges presiding over the case heard arguments from Novartis as to why they deserved a patent on the mesylate salt of the blood and intestinal cancer drug imatinib. In recent weeks, the judges heard the counsel for the Indian government, and then representatives for the Cancer Patient Aid Association on arguments to defend India’s stricter patentability criteria that discourages patenting of new forms of known medicines. The judges have now retired to consider their verdict; there is no indication at this stage to suggest when the judges may hand down their findings. "With this precedent-setting case nearing its end, we sincerely hope that the integrity and intention of India's patent law, and Section 3d in particular, is upheld. India's ability to continue production of affordable medicines for the developing world depends a great deal on the country's patentability standards and how they are interpreted by the courts in India. We will now wait for the judges' verdict to be released." Section 3(d) led to Novartis being denied a patent for imatinib mesylate (marketed by Novartis as Glivec). Novartis is contesting the Indian patent office’s and appellate body’s decisions to reject the company’s application for a patent on the salt form of imatinib. A win for Novartis would set a dangerous precedent, severely weakening India’s legal norms against ‘evergreening’, a common practice in the pharmaceutical industry. A single medicine can have several applications pending for separate patents, each relating to a different aspect of the same medicine. 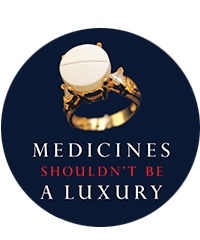 In this case Novartis is pushing for an interpretation of patentability standards that would inevitably lead to patents being granted far more widely in the country, blocking the competition among multiple producers which drives down prices, and restricting access to affordable medicines for millions in India and across the developing world.